The Mizell's: #1 baby, Avery!! 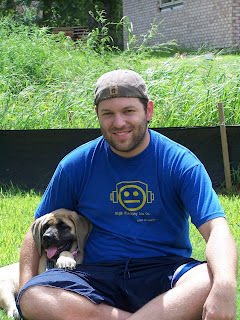 Avery and Ben, one of the first days we had her... very timid and small!! Avery and Ben today!! Avery has become mommys girl big time!!! Ben says its since I've become preggers, weird actually... she does not leave my side, she must sleep right next to me, if not on me!! I'm pretty sure she weighs around 120lb now!! Stare contest!! You can also see what's starting to be a baby bump.. 13 weeks, 3 days!! Ben lets her lick him on the face... no thanks!! She's going to be a great, big, protective big sister! !